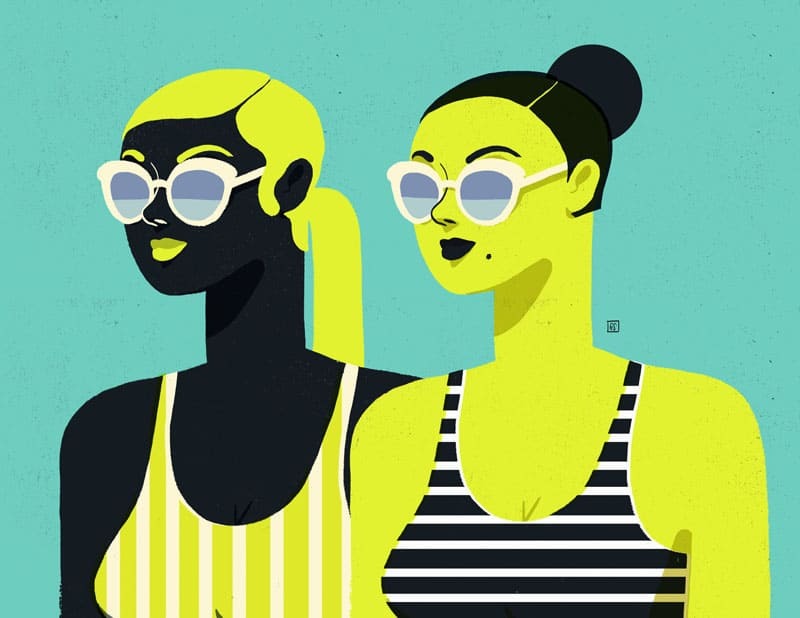 Women in Summer by Geraldine Sy, a young illustrator from the Philippines shows a minimalist and modern illustrations of girls in summer. She originally wanted to show her skills as an illustrator- and was inspired by the heat of the summer. Thus, her project Women in Summer. Women/Summer started as a way of promoting my skills as an illustrator. I wanted to create an illustration that would appeal to modern fashion magazines. The idea of women and summer was not new to me, but I decided to play around with highly contrasting colors to capture the atmosphere of heat and brightness that I associate with summer. Once I decided on the concept of high-contrast/women/summer/swim-suits, it was pretty straightforward after that. I kept the details to a minimum to bring the color forward, and posed the girls simply. With Women/Summer, I was inspired by the idea of summer, the sun, swimming pools, beaches, and minimalism. It gives me the aura of heat of the sun and coolness of the breeze at the same time. I think my style is contemporary, yet I am still very much influenced by the art of the past decades. My inspirations are Margaret Kilgallen, Saul Bass, a bit of Andy Warhol, and a lot of modern illustrators. Geraldine Sy is an illustrator and graphic designer by trade – she lives and works in Cebu City, Philippines. Currently, she’s an in-house artist in a publishing company in Cebu. See more of her work on Behance or her website. Love the retro-ish look! I also think that if you wanted to showcase your talent, this is a proof. How you use a few colors and still evoke the vibe you wanted to shows your versatility. Great job, Geraldine!